Please note ticket is only valid for entry until 12.30pm; after then it's first come first serve basis! Las Mexicanas Summer Rooftop presents...Cino De Mayo Party! Get the Mexican celebrations started early at our Rooftop Terrace, where you can sip on our incredible cocktails, enjoy live female mariachis Las Guadalupes at 2pm; wandering Mexican wrestler La Rana Venosa for amazing photos; and join a drop in workshop making the ultimate Trump piñata with Katapixia for a collective smash finale. La Rana Venenosa, the Queen of the Sewyer, is a luchadora for Lucha Britannia. She has wrestled for seven years across London and Europe. Her fighting style is slimy and ruthless, like a kiss with too much tongue. Rana also has a book coming out in July - A Grrls Guide to Wrestling - published with Unbound. Mariachi Las Guadalupes' speciality is in creating beautiful arrangements of authentic Mexican tunes to suit female harmonies, and in fun and creative arrangements of English classics in a mariachi style. 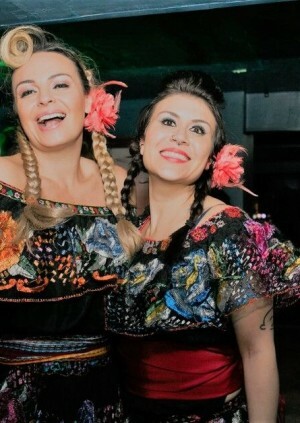 Katapixia is Mexican-American, living in London, UK. An incredible artists, she has uses recycled materials whenever possible to make piñatas with a punch, and will be leading the incredible drop in workshop all day.